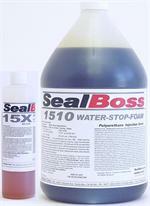 Purchased your water stop crack repair kit [SealBoss DIY Water Stop 1510] from Dependable Depot for concrete work in my own basement. Product worked fantastic. No other specialty concrete repair companies in my area to my knowledge. I enjoyed working with your product and am looking to do some basement repair for side work. I am currently employed with a roofing, siding, and light construction contractor. Looking for forward to receiving more information. Just wanted to say how glad I was to have your product on Monday. I live in Cobb County, GA and the water came pouring in during our recent flooding. I had already actually patched one of my two retaining wall cracks and already had the holes drilled for the second. However, I had not pumped the second one, so I got a desperate call from my wife for help when the rain hit that critical point and water stacks up against the front of our house. I got there from work as quickly as I could and still had to tighten the packers and mix the resin, but I had the water stopped inside of 15 minutes and we got nothing wet except for a few towels! What a lifesaver! There are a couple of areas that I just could not get the foam into so I am going to have to drill a few holes to make certain everything is sealed. I will need to order a few more more packers for that. I have bragged to many guys here at work about the DIY system and several have asked for your info for themselves or others, so I have passed your website along to quite a few already! 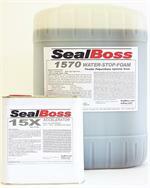 - React to foams (water-stops), gels and solid (non cellular) flexible or semi flexible sealants. - Single or two component, accelerators common. Viscosities low to medium. Very resistant, long term solution. Conclusion: In non structural water related repairs PU is generally the material of choice. This is true for most below grade repairs including basements, tunnels, parking garages and manholes. EP is excellent for structural repairs of stressed structures and deteriorated concrete. - Not a water-stop material and does not tolerate extended movement. - Two component. Viscosities from very low to paste. Very resistant, long term solution. Reason: PU injection is often performed in a wet environment where adhesives for surface ports cannot be used. Mechanical packers are installed by drilling a hole into the structure which the packer fits snugly. The packer is tightened mechanically for high pressure injection. PU immediately reacts with moisture in the crack increasing resistance of product flow which explains the high injection pressures. Conclusion: PU generally needs higher pressures and therefor the more sophisticated connectors / packers. There are many exceptions. For example curtain injection with PU gel into the space between structure and soil needs lower injection pressures but higher rates of material flow. The filling of larger voids and joint injection also uses lower pressures. PU injection through surface ports is not common, but high pressure epoxy injection through packers is seen more frequently. Reasons could be very thick concrete to be penetrated or damp / wet surface conditions. Reason: Injection is typically done in dry environments and surface ports can be attached easily with epoxy adhesive. Holes do not have to be drilled . However the crack surface between the ports has to be surface sealed to prevent leakage during injection. The viscosity of the epoxy resin stays low during the injection process, resulting in much lower injection pressures. PU foams, accelerator to be added prior to pumping. PU resins such as 1400 LV-Resin Line. for hydrophilic PU Gels based on the application and product. In multi-ratio pumping one component carries a high water content. Single component pumps include inexpensive hand held devices, hand pumps and electric pumps. Multi ratio devices can be manual, electric and pneumatic. Some PU injection pumps can be used for epoxy injection (with limitations). SealBoss supplies PU as small as 1 gal units. We do not supply PU in cartridges for the following reasons: 1. Reduced shelf life in cartridge due to high moisture sensitivity, 2. Limited Injection pressure. For small jobs we recommend our (3000psi) handgun and a 1 gallon unit. Final Remarks: Injection Technology has become more refined and in cases more confusing. Modern products are very capable, but similar characteristics are not easily distinguished by the untrained person. To avoid costly failures caused by product/job mismatches, SealBoss provides thorough technical support to make your job a good one. Please make use of our services - we are just a phone call away. 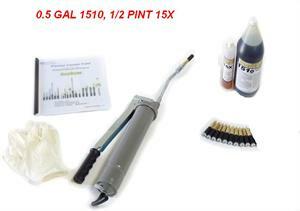 - Two component equipment for most epoxy resins for ease of use and precise mixing. thoroughly. Epoxy is a very strong adhesive and may render a pump unusable. Two component injection pumps are pneumatic or electric. SealBoss supplies EP resins and paste also in cartridges for the following reasons: 1. Ease of use, 2. Cost, 3. EP is not very moisture sensitive and injection pressures can be handled by quality cartridges and dispensers. Dispensers are manual or pneumatic. With very few exceptions EP pumps are not to be used for PU injection. SealBoss 13-70B Brass Mechanical Packers, 1/2" x 2.75"
13-70Zi Zinc Mechanical Packers, 1/2" x 3"